The Alliance of Retired Americans brings together retired union members and other senior and community activists, and seeks to engage in "important" political battles to protect and preserve programs vital to the health and economic security of older Americans. In 2001, the national AFL-CIO helped establish the Alliance for Retired Americans , a "progressive retiree organization". ARA opened its arms to community groups, too. SOJ, the retiree group, had found a new home! Eva Dominguez, Alliance for Retired Americans Legislative Representative, 2014. Since 2002, several state affiliates have been chartered and more states are coming on board. The following is an alphabetical list of the Alliance's state affiliates. 400 activists came to Washington, DC for the Alliance for Retired Americans’s 2015 National Legislative Conference in July . The activists reached more than 150 offices on Thursday’s Lobby Day, when they met with their Members of Congress and Senators and voiced their concerns about retiree issues. Alliance members lobbied their elected officials with very specific goals in mind, including: expand earned Social Security benefits; protect Social Security Disability Insurance; preserve Medicare and allow no cuts to it; and oppose the Trans-Pacific Partnership (TPP) Trade Agreement. Richard Trumka, President of the AFL-CIO, began the conference with a fiery speech on Tuesday. Several elected officials addressed the attendees: House Democratic Leader Nancy Pelosi (CA), Senators Bernie Sanders (VT), Debbie Stabenow (MI), and Elizabeth Warren (MA) and Representatives Keith Ellison (MN) and Ruben Gallego (AZ). On Wednesday evening, the President’s Award was presented to Judy Cato, Executive Vice-President Emerita, for her activism and years on the Alliance Executive Board. 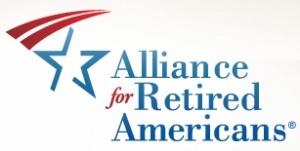 The Alliance for Retired Americans Letter to the Editor Campaign. "Retirees with the Write Stuff" is a new project of the Alliance for Retired Americans to encourage more retirees to write letters to their local newspaper. Get a free "Write Stuff" pen, plus your name in our weekly newsletter, Friday Alert, and on our website. Congratulations to Charlie Averill, Janice Ayres, Don Badie, Charles Balban, Glenda Barnes, Elmer Blankenship, Bruce Bostick, Kathy Breeden, James Brown, John Brown, Leon Burzynski, John Cardwell, John Campbell, Don Dallas, Barbara Davis, Barbara DeVane, Graham Dewsbury, Jim Diulio, Helen Donovan, Robert Dougherty, Michael Dzwonczyk, Mary Elia, George Epstein, Billy Feitlinger, Earl Frampton, Shane Fox, Barbara Franklin, Tony Fransetta, Dave Friesner, Charles Fyffe, Gary Gaines, Shirley Gauger, Marilyn Ginsburg, Patricia Gooden, John Guevarra, Al Hamai, Julie Harbin, John Harris, Doug Hart, Joyce Hermanstorfer, James Hopkins, Jan Howe, Owen Humphress, John Ingle, Val Jack, Mary Lou James, Elaine Jones, Ellen Kadransky, Norman Kaiser, Stephen Keister, Jennifer Kenny, Jan Keshian, Larry Kitson, Elizabeth Knauf, Robert Kortkamp, Charlie Lemon, Linda Linderman, Gerald Lotierzo, Bea Lumpkin, Marie Malagreca, Charles Matul, Paul McGavis, Donna McGrath, Urias Meadows, David Meinell, John Mendolusky, Bruce Miller, Herbert Miller, Alfred Moskowitz, John Newman, John Pernorio, Charles Pervo, J.C. Phillips, Catherine Porter, Dianna Porter, Lee Pound, Linda Pratt, Don Rowen, Julius Sawicki, Terry Schleder, Lenora Schur, Dorothy Seigel, Paul Shanabarger, Vivian Silbiger, Mark Smith, Dorothea Stebbins, William Stevens, Jean Stillwell, Beatrice Stratton, Adam Swope, Arthur Valdez, Fred Vogt, Martin Walsh, Scott Watts, Norm Wernet, Laura Wickwar, Monty Williams, Curt Wilson, Malcolm Wright, Chuck Yarter, Elmer Yuen and Jack Zuckerman on their recent publications! This page was last modified on 4 August 2015, at 18:47.